It’s not yet Valentine’s Day, yet I’m seeing random Easter items already popping up in stores. While a part of me is like ‘really, already?’ – another part is like ‘Cadbury Eggs? YES PLEASE!’ While other people go crazy for the jelly beans, I’m all about the Cadbury stuff, and have been since I was little! 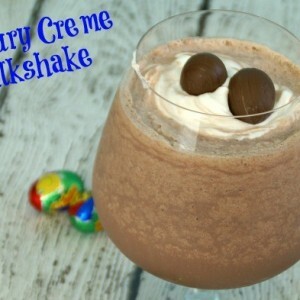 Last Easter my mom even sent me a package with a TON of them – she’s just awesome like that 🙂 To get a little creative, let’s give this oldie-but-goodie a fresh share: Cadbury Creme Milkshake! 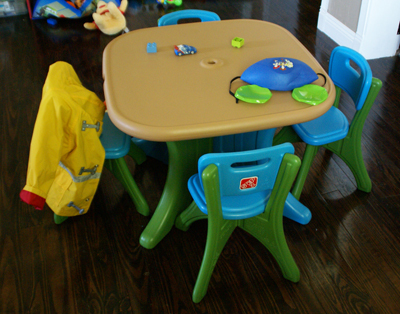 Contains affiliate links that help support this blog at no extra cost to you. See our disclosure policy for more info. Did you know we’re now on Yummly? It’s such a neat place where all you do is ‘Yum’ the recipes you want to keep track of – on ours just check out the purple ‘YUM’ circle to the left. Easy-peasy, right? Be sure to yum all your favorite recipes! When I first tried this recipe version, we’d just moved to Texas (this was in early 2013) and our old blender didn’t make it. I guess there’s plenty of other things that would be worse to lose in a move! Anywho, we had to buy a crappy blender just to get by – but NOW I have this amazing Nutri Ninja® Auto-iQ Pro Compact System that takes on my most challenging blender tasks! I highly recommend it for this creamy milkshake. There are technically three ‘steps’ for this Cadbury Creme Milkshake: 1. The fondant cream 2. the whipped cream and 3. the milkshake. 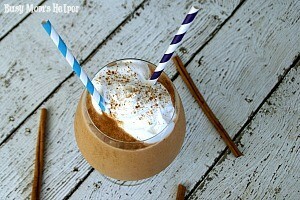 Of course, you CAN skip the homemade whipped cream and use store bought, if you’d like! In a bowl, beat the corn syrup and butter until smooth. Add vanilla, salt and powdered sugar. Beat until well-mixed. Set aside. Beat the whipping cream until it starts to thicken, usually a few minutes. Slowly add the powdered sugar and vanilla, continuing to beat until stiff peaks form. Set aside. In a blender, blend these (except optional egg) with the fondant cream until smooth. Pour into a glass, top with the whipped cream, and, if desired, crack the Cadbury egg on top as garnish (and more Cadbury egg deliciousness). Enjoy!!! 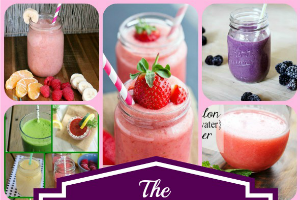 Check out these other delish drink & beverage recipes! There’s no point denying it, motherhood is hard! We work so hard for our families, and too often we forget to take care of ourselves because we’re just too dang busy. It’s super important for us to take time to recharge, refresh…even reward! Here’s a delicious New Way to Treat Yourself! Plus, free printable tags in case you want to ‘treat’ a friend! One of my favorite ways to unwind is snuggling up on the couch with Hubby, watching something while enjoying a creamy bowl of New DREYER’S Frozen Custard. After we tried some of their awesome flavors, I had to get the others! Just swing by the ice cream aisle at Walmart and you’ll see all the options…. For those of you living more East than Colorado and Texas, you’ll check out the EDY’s® Frozen Custard! So what fabulous flavors DO they have, you ask? ALL of these are made with fresh milk and have no artificial colors or flavors. My personal favorite is the Peanut Butter Pie: sweet cream frozen custard with lots of chocolate cookie pieces and beautiful peanut butter swirls. It’s YUMM-O! I’m so in love with how extra thick and creamy it is…..LOVE, I tell you! If you want to learn (and maybe taste…Woot woot!) a little more before you commit, check out one of their in-store demos taking place across the country March 26th-29th! Look for a store near you HERE. Don’t forget to check out DREYER’S (or EDY’s®) Social Channels! What flavor are YOUR most excited to treat yourself to? Happy 4th of July, y’all! 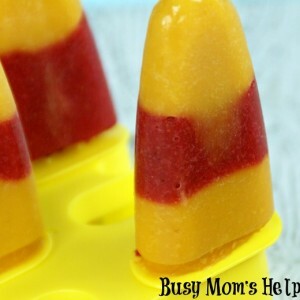 In celebration of today, I’m sharing a super (like, as simple as can be) recipe that will help you beat the heat and have a special treat: Strawberry Mango Popsicles! I have to say, I’m so proud and grateful to live in this amazing country. No, it isn’t perfect and there’s plenty of issues, but I still believe it’s the best place for my family and appreciate all the freedoms we enjoy. I hope to one day make a road trip to see the Declaration of Independence and the signatures of our Founding Fathers! Slight venting moment: it’s so dang HOT lately! H-O-T! So maybe I’m a wimp with weather, but come on…hitting 90-100 degrees by 11am is kind of ridiculous, am I right? 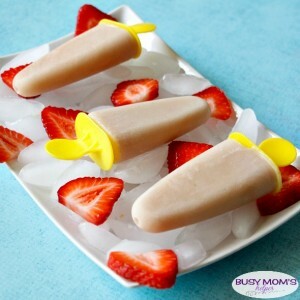 For this special day, I hope your family can cool down and enjoy a tasty treat with this Strawberry Mango Popsicles. They’re so easy, I almost feel guilty posting it as a recipe (except the simplicity of it gives me more time to spend with MY family on the holiday, so I’m just fine with it)! Blend the Strawberries in a blender or food processor. You can just blend it a little so there’s still chunks, or make it totally smooth, up to you. Set aside. Repeat with the Mango pieces. 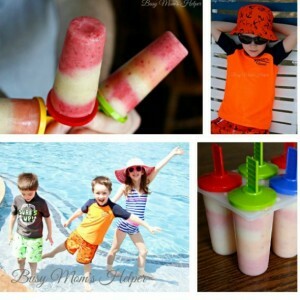 Pour the different mixtures into your popsicle molds and put in your freezer until frozen. Enjoy! See, told you it couldn’t get much easier than this! Try it with other fruits, too. It’s fun to mix in some slices or bites of the fruit, also. Delicious, simple and oh-so-fun (and pretty, too)! Now, ta-da! 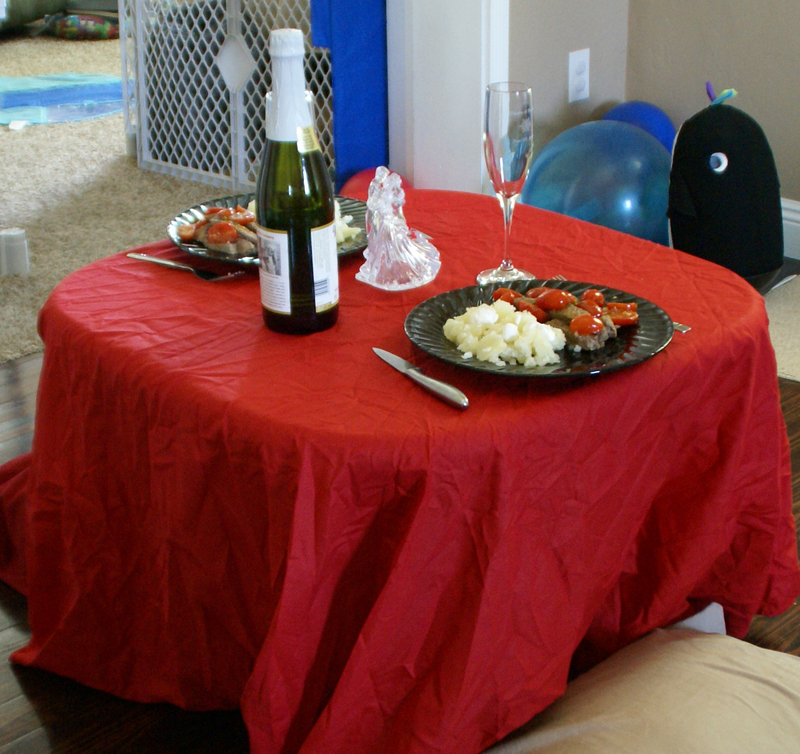 A romantic lunch for two! 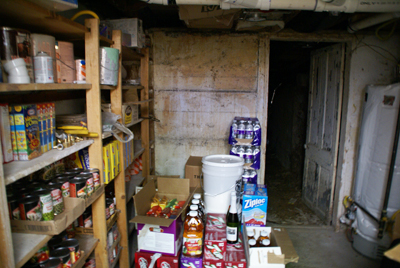 Now, we’ve lived in our home for almost 5 years now (literally, next month), and I have only braved our cellar one time. 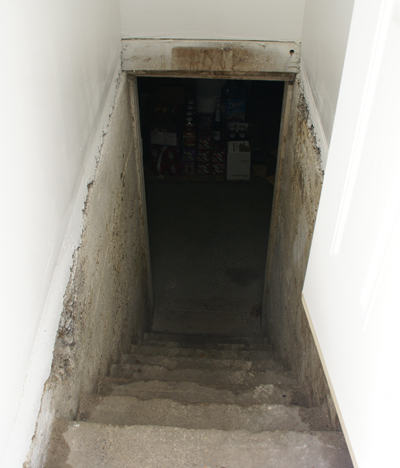 The entrance is outside, the stairs are steep, and it’s yucky and dusty. Spiderwebs, sometimes mice I’m sure. It’s just not somewhere I ever choose to go…until today! I decided our lunch needed a little ‘bubbly’, so I gathered all the courage I could and went down into that gross, dingy cellar and grabbed a Sparkling Cider. Yup, I’m an awesome wife! Put 1 tbsp. oil in large skillet over medium heat. Add steaks, seasoned with salt and pepper. Cook until done as desired (we like medium). In empty (or clean) skillet, cook tomatoes, sugar and pepper flakes until tomatoes are softened; about 3 minutes. Stir in garlic and cook about 30 seconds to 1 minute; when begins to be fragrant. Remove from heat and stir in parsley, lemon zest, lemon juice and remaining oil. Season with salt and pepper. 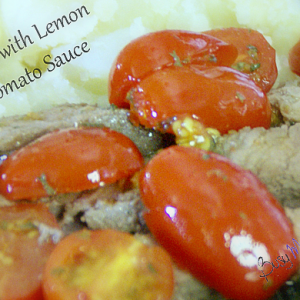 Slice steaks and cover with tomato mixture. Serve! For dessert, since I was throwing all of this together so quickly, I made a Vanilla Pudding Freeze Pie. 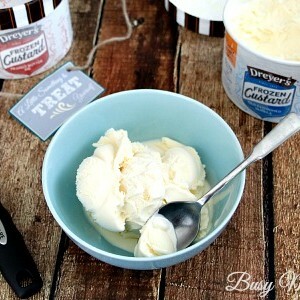 It’s chilled just enough to make a creamy and satisfying treat. Mix pudding mix, milk and whipped cream together until well blended. Scoop into pie crusts until just slightly higher than the edge of the crust. Top with your topping of choice. Put in the freezer for about 10 minutes, or just while you’re eating your main course. Notes: Feel free to use other flavors of pudding. This is just the one I had on-hand. If you’re wondering about the glasses and the centerpiece: those are actually from our wedding! The centerpiece was from our cake, and the glasses we used for toasting. Thought it would make it a more special lunch! 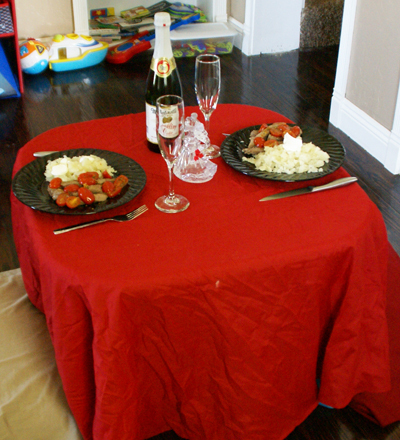 Have you ever done a surprise romantic meal for your hubby at the last minute? What did you pull together to make it even more special? I’m not sure about you, but we’re DEFINITELY feeling the summer heat here in Texas so far. Still not the scorching temperatures we’ll be hitting in the later months, but hot and muggy just the same. Other than hitting the pool (and wearing out the kids…bonus! ), cooling off with a delicious cold treat it just what the doctor ordered! 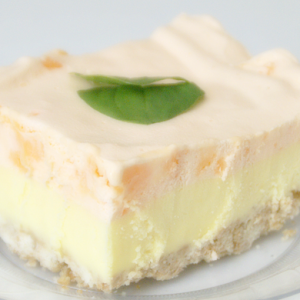 This Creamy Orange Dream Pie is full of creamy, refreshing flavor. Another great thing? It’s SUPER easy to make! 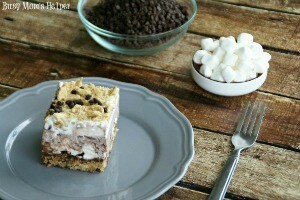 Whip a few things together, refrigerate a bit, and then you’re enjoying the perfect dessert! In a 13×9 pan, line foil with the ends extending over the sides of the pan. Mix wafer crumbs and butter. Press firmly onto bottom of pan. In medium bowl, mix pudding mixes and milk until well blended. Stir in half of the whipped cream. Spoon evenly over the crust. Place in refrigerator for 10 minutes. Mix sherbet and remaining whipped cream until well blended. Spoon over pudding layer after done in the fridge. Cover and freeze for at least 3 hours. Use the foil ends to remove the dessert from the pan before cutting to serve. I bet this recipe could be altered for pretty much any flavor; it just depends on the ice cream. I’m eager to try it with chocolate or mixed berry. What would you try, and if you do try something, let us know how it turns out!